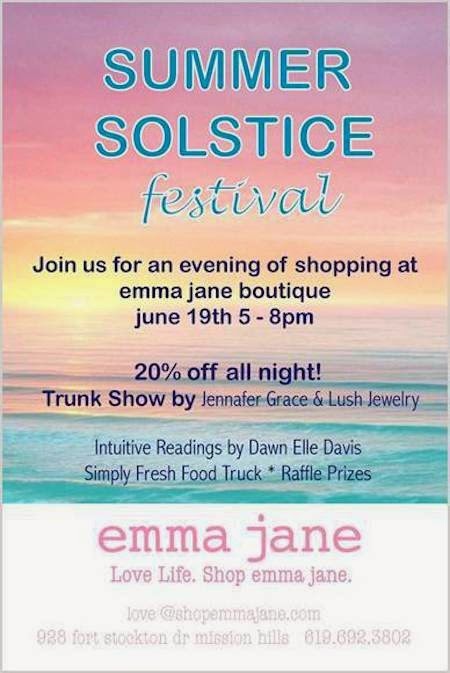 Emma Jane, a stylish boutique located in Mission Hills, is hosting their first ever Summer Solstice Festival to take place this Thursday, June 19th, from 5-8 pm at their Mission Hills store location. Guests will enjoy fashion, food, raffle prizes and 20% off ALL purchases all night! Intuitive readings will be given by Dawn Elle Davis and the Simply Fresh Food Truck will be serving up delicious bites and drinks. Additionally, Jennafer Grace and Lush Jewelry will be hosting trunk shows featuring their one-of-a-kind clothing and jewelry pieces.